We have just spent two days on the Putney foreshore, working under the shadow of St.Mary’s Church next to Putney Bridge. 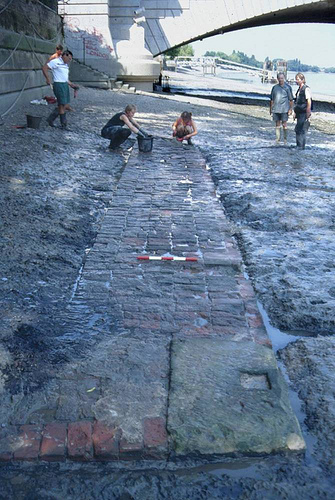 Thames Discovery Programme archaeologists and volunteers had started work previously at the week-end and the site was already clear and largely free of mud though fine silt was evident on areas of the foreshore. We continued with the brushing and washing down of this substantial horizontal brick structure situated close to the Thames embankment until we were able to take readings and record that section on which my colleague Chris and I had been working. Measuring some 15 metres x 3 metres, the brick structure ran parallel with the river embankment and at the westerly end it angled towards it. Running at right angles and butting up to the main brick structure were two separate horizontal brick courses. What was its purpose? Was it in any way connected to the construction of the old timber Fulham Bridge built across the Thames in 1728 or was it part of the foundation of the Toll House for the bridge? A fascinating discussion between two parties had erupted; two knowledgeable volunteer members – one felt it was more likely to be the beginning of the old timber bridge because of the known factor of 24’ as width and the angle would be the juncture where the road curved to meet the beginning of the carriageway. But this was opposed by the second pointing out that the structure followed the shape of the toll house with one wall parallel to the river and one shooting off below the church. Further points to consider would be the distance from the angle and wall of the church. Not feeling qualified to do more than speculate and look at old photographs of the area we very much look forward to Nathalie’s conclusions on this small section of the project.